Maria Gripe was born in 1923 in Vaxholm and moved to Orebro at the age of six. She made her literary breakthrough with the three books about Hugo and Josefin in the 1960s. 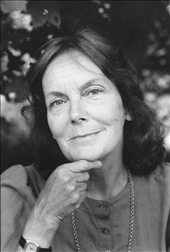 During the same period she wrote “Pappa Pellerin’s Daughter", a contemporary novel about a lonely, headstrong girl. After the poetic and atmospheric tales “The Glassblower’s Children", “In the Time of the Bells" and “The Land Beyond", she returned to reality in the 1970s with the five Elvis books, featuring a serious-minded boy who became a classic figure in Swedish children’s literature, unforgettably interpreted in Harald Gripe’s illustrations. In the 80s came what was perhaps her best known and most loved books: “The Dung Beetle Flies in the Twilight" and “Agnes Cecilia", as well as the four books in the Shadow series. Maria Gripe has received a number of awards and prizes for her work, both in Sweden and abroad. Among others, she has received the Nils Holgersson plaque, the newspaper Expressen’s Heffaklump, the Astrid Lindgren Prize, the H C Andersen Medal, the Hjalmar Bergman Prize, and Litteraturfrämjandet’s major prize (together with Harald Gripe). In 2005 Bonnier Carlsen introduced the Maria Gripe Prize, an annual literary prize awarded to a Swedish author published by the company.